One student spent more than six hours interviewing a subject. Another rode along with a police officer all night as he patrolled the streets. A third listened to the riveting account of a man who vomited death-black blood all over his bathroom walls as his liver began to fail. 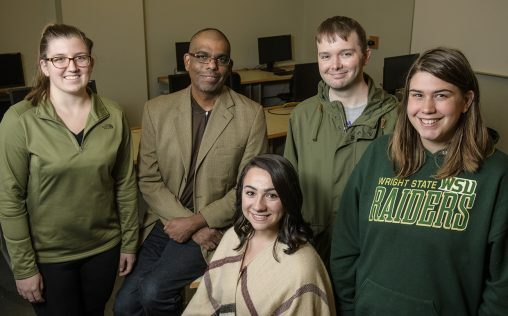 It was all part of the Poverty Project, an ambitious initiative by students in Wright State University’s Advanced News Writing class to put a human face on the region’s poor as well as to chronicle the causes and effects of being destitute. The project is the brainchild of instructor Ray Marcano, who teaches the class along with adjunct faculty member Ken Paxson. Marcano clawed his way out of poverty growing up in the Bronx and climbed to the highest rungs of the journalism profession. “I wanted to give my students something this semester that had more substance and was challenging for them and would not only teach them about an issue but teach them something about themselves,” said Marcano, an award-winning reporter and editor who had a long career with Cox Media. Marcano said that when people think about poverty, they generally just think about the lack of money. About 25 students are in the class, all of whom hope to go into journalism, public relations, multimedia and related fields. Marcano said many of the students were at first intimidated by the project, unsure of how to approach it and not confident they could produce in-depth, professional-quality stories. The students brainstormed together and came up with a list of story ideas for the project — everything from how illnesses, accidents, drug abuse and even student loan debt contribute to poverty. Reporting, editing and other duties were split up among the students and stories assigned. One story revealed pockets of poverty in the region, some of them in otherwise affluent neighborhoods. Another story profiled a 74-year-old retired autoworker who thought he would have a comfortable retirement until a catastrophic illness left him virtually bankrupt. Still another described the experience of a man who was badly burned in a gasoline explosion as he was clearing brush and is now on Social Security disability. Kristin Baughman, editor of Wright State’s student newspaper The Guardian, serves as editor-in-chief of the Poverty Project. 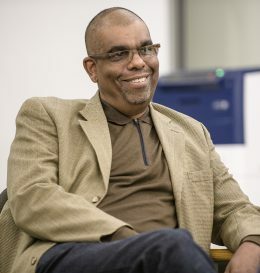 The Poverty Project is the brainchild of communication instructor Ray Marcano, pictured, who teaches the class along with adjunct faculty member Ken Paxson. Marcano said the biggest lesson for the students was that they could do something they never thought they could do. “I think it’s a ‘wow factor’ for them,” he said. The stories have been posted on the project website. Madison Smith, of Urbana, is in charge of social media on the project, posting links to the stories on Facebook and Twitter. Some of the stories have also been posted online by the Dayton Daily News, which has also published excerpts in print editions. Sarah Conard, editor-in-chief of the Dayton City Paper, is managing editor of the Poverty Project.